Only supernatural beings can fully contemplate just how awfully Chan Ho Park pitched for Texas. Mere mortals quail in terror and hide in caves at the sight of his stat line. Nevertheless, I will go where angels fear to tread by examining Park’s tenure with the Rangers. How did Park become a Ranger? An ugly confluence of desperation and availability. In 2001, The Rangers signed Alex Rodriguez to a ten-year, $250 million contract and expected to contend immediately. The ’01 offense ranks among the best in franchise history, yet it was undercut by a spectacularly awful pitching corps. The Rangers’ ERA+ of 78 that season was the worst in the American League in the history of divisional play. The top six members of the rotation combined for 145 starts and an ERA of 5.74. After three division titles in four years, the Rangers had finished in the basement for the second consecutive season. Meanwhile, Chan Ho Park had finished his fourth solid season in five as a starter with the Dodgers. In eight years with Los Angeles, Park amassed a 3.80 ERA, and ERA+ of 110, and a record of 80-54. He struck out over eight batters per nine innings. He had the same agent as Alex Rodriguez, the notorious Scott Boras. At that time, Boras and owner Tom Hicks were on unnervingly cordial terms. On that basis, Texas signed Park to a five-year, $65 million contract on January 16, 2002. Alas, Hicks and new General Manager John Hart did not do their homework, or perhaps they assumed away Park’s warning signs. Park walked or hit nearly five per nine innings. Outside of Dodger Stadium, among the friendliest parks’ for pitchers in baseball, he had an ERA of 4.80. He had a reputation of emotional fragility and perhaps lacked the mental toughness to be a staff ace. Chan Ho Park comes to Texas with a big contract and high expectations to be the staff ace and leader. It won't happen. Park will struggle away from the pitching-friendly atmosphere of Dodger Stadium. Even in retrospect, it’s hard to fathom how quickly Park descended to pariah status. Park pitched adequately in Spring Training (4.50 ERA, 5 BB, 16 SO in 16 IP) but was troubled with a hamstring pull. On April 1, 2002, he started Opening Day in Oakland and offered the kind of performance that would signify his entire career with Texas. Park allowed a leadoff single to Jeremy Giambi and hit Randy Velarde but escaped unharmed by inducing a double play grounder from Scott Hatteberg. In the second, he allowed a solo homer from Eric Chavez. In the third, he permitted an RBI-double by Frank Menechino and a two-run homer by Dave Justice. He gave up two hits to start the sixth and was replaced by Todd Van Poppel, who allowed both runners to score before returing a batter. Final line: five-plus innings, nine hits, no walks, a hit batter, six earned runs, only ninety pitches. Park aggravated his hamstring pull and hit the Disabled List. He would not pitch again until May 12. On June 23, he offered his first quality start in nine attempts. The effort lowered his ERA to 8.52. Park missed another three weeks in August with blisters, but in his final eight starts (and with the season effectively over) he showed why Texas signed him. Park had six quality starts, five wins, and a 3.29 ERA. He gave Texas some hope for 2003. It didn’t last. 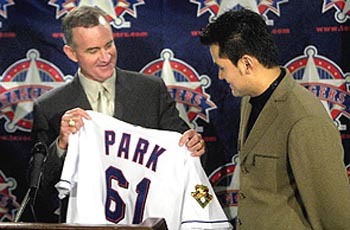 Park had struck out a career-worst 7.5 per nine innings in 2002, yet it was his high mark as a Ranger. Park allowed six runs in 3.2 innings in his 2003 debut at Anaheim. By the end of the month he had a 7.16 ERA and revisited the Disabled List with a sore lower back. He returned on June 27, allowed three runs in two innings to Montreal, and left after 33 pitches when he reinjured his back and rib cage. Park would not pitch again in 2003. 2004 granted little improvement. Park did make eight consecutive injury-free starts to begin the season with a relatively benign 5.80 ERA, but he hurt his back once again and missed over three months. He finished with eight more starts and a 4.87 ERA. His ERA+ of 93 would be the best he would ever tally as a Ranger. Park had to earn a rotation spot in 2005. With “only” two years and $29 million left on his contract, Texas considered waiving him during the spring. Park did earn his job and has remained healthy, making twenty consecutive starts. The results have been the usual grab-bag: ten quality starts mixed with a pitiful effort against Oakland last Sunday and a dumbfounding, one-inning, eight-run line at Los Angeles in June. Even with a rotation in tatters, Texas jumped at the opportunity to rid themselves of Park. So, how bad was he? In three-plus years, Park spent 319 games on the active roster and 278 on the Disabled List. Aside from 2005, he never made more than fourteen consecutive injury-free starts. He leaves Texas with an ERA of 5.79 and an ERA+ of 85. Per the folks at Baseball Prospectus, Park made 68 starts and won all of 2.5 more games than a replacement-level pitcher, assuming typical run support. If not for Dempster (who has resurrected his career as the Cubs’ closer), Park would stand alone as the worst starter in baseball during the last four years. Park’s VORP of zero means he’s pitched exactly at replacement level as a Ranger. What is a replacement level? John Wasdin. R.A. Dickey. Pedro Astacio over the last few years. Guys like that. Almost no one compares to Park, because everyone else in baseball pitching this poorly has been pulled from the rotation or cut. That would have been Park’s fate if not for his contract.